PRINCETON – Those who lead Israel’s defense establishment often come to consider peace with the Palestinians a necessary condition for the country’s security. Being tasked with maintaining the territories Israel has occupied since the Six-Day War in 1967 evidently causes the military and security brass to support political measures that would end the occupation. And yet the government shows no interest in pursuing a permanent settlement. To appreciate this divide, consider the late Meir Dagan, who served as Major General of the Israel Defense Forces (IDF) and then as Director of Mossad, Israel’s intelligence agency. Several years ago, I sat on a panel at a conference in Jerusalem convened by then-Israeli President Shimon Peres. To my right sat Dagan, who had just completed eight years as head of Mossad; to my left sat Dore Gold, a former academic and former Israeli ambassador. The two men held very different views about how best to guarantee Israel’s security, and it is worth recapitulating their respective arguments. Gold argued that returning to pre-1967 armistice lines would leave Israel without “defensible borders.” He insisted that Israel could guard against threats from the east only if it maintained a military presence in the West Bank and controlled the Jordan River – which runs along the border separating Jordan from Israel and the West Bank. Dagan countered that the military’s role is to safeguard Israel’s borders, regardless of where those borders are drawn. While the IDF would certainly prefer to operate with the strategic advantages that holding more territory can confer, it would fulfill its mission under whatever conditions the Israeli government set for it. But Dagan went further, describing the principle of “defensible borders” as a canard that ignores the intentions and capabilities of the party on the other side of the border. With an Israeli-Palestinian peace agreement, the burden of defending the border would be vastly reduced, because Israel would have a serious cross-border partner with a mutual interest in avoiding armed conflict. A Palestinian security force would by default provide a significant measure of security for Israel as well. Dagan’s dovish position has a long tradition in Israel’s defense establishment. Peace Now, a nongovernmental organization that represents Israelis who support a political resolution to the Israeli-Palestinian conflict, was founded in 1978 when 348 IDF reservists sent a letter to then-Prime Minister Menachem Begin urging him to conclude the peace process with Egypt. Similarly, in the aftermath of the first Intifada, the Palestinian uprising that lasted from 1987 to 1993, the defense establishment led the effort for peace. In 1991 Yitzhak Rabin – a former IDF chief of staff, prime minister, and defense minister who at the time served on the Foreign Affairs and Defense Committee of the Knesset, Israel’s legislature – argued for a comprehensive regional peace effort. Like Dagan, Rabin considered the Arab-Israeli conflict to be a burden on Israel’s security, and both active and retired military officers have since then led or participated in negotiations with the Palestinians and with Syria. Most recently, many prominent former defense figures supported the deal reached between Iran and the so-called P5+1 (China, France, Russia, the United Kingdom, and the United States, plus Germany) over Iran’s nuclear program – an agreement that Israel’s government bitterly opposed. Indeed, the divide between the security establishment and the politicians now governing Israel seems wider than ever. Most former senior defense officials echo Dagan’s argument, while government officials sound more like Gold. The nongovernmental organization Commanders for Israel’s Security (CIS), with more than 200 members from Israel’s security elite, just published a paper titled “Security First” with a comprehensive set of proposals to revitalize efforts to share peacefully the land west of the Jordan River. CIS maintains that terror against Israel cannot be defeated by military means alone, and that any peace process must improve Palestinians’ quality of life. Senior former Israeli security officials also participated actively in a study undertaken by the Center for a New American Strategy that produced a detailed security plan for an Israeli-Palestinian agreement. Some former officials have gone even further: Former Mossad Director Efraim Halevy argues that Israel should accept “the political reality of Hamas” and open a dialogue with the organization that governs the Gaza Strip. Likewise, in the 2012 documentary The Gatekeepers, six former heads of Shin Bet reflect on the lessons of the past few decades and issue a call for peace with the Palestinians. Remarkably, Israel’s political leadership has not suffered electorally for ignoring the views of the defense establishment. There was no public reaction when, after The Gatekeepers was released, Prime Minister Binyamin Netanyahu’s office issued a statement saying he had not seen the documentary and had no intention of doing so. 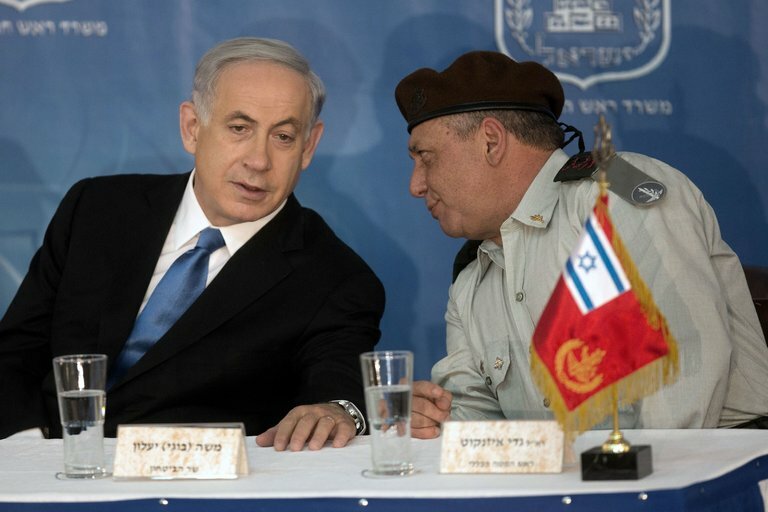 Given the public’s high regard for the Israeli defense establishment, particularly relative to the government, voters’ indifference is a mystery. In a 2015 survey conducted by the Central Bureau of Statistics, 93% of Israeli Jews expressed trust in the army, compared to only 40% in the government, and only 22% in Israeli political parties. One answer is that, after so many failed efforts, the Israeli public is disillusioned with the peace process. Moreover, acts of incitement and terrorism emanating from the occupied territories have intensified. This allows the current governing coalition to justify policies – such as enabling expanded settlement activity in the West Bank – that further deepen the conflict. Against this backdrop, Netanyahu has portrayed himself as Israel’s protector, appropriating the esteem afforded to the defense establishment. Those calling for a renewed peace process will now have to make their case to the public and reclaim that title. Whether they can do that in a context of regional turmoil and domestic insecurity remains uncertain, to say the least.